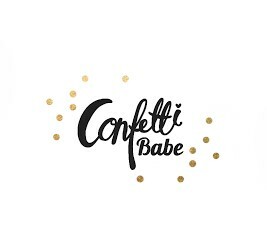 How was your week Confetti Babe Readers?! I hope you are enjoying the very last days of this summer like weather. We sure are in the Koch household! 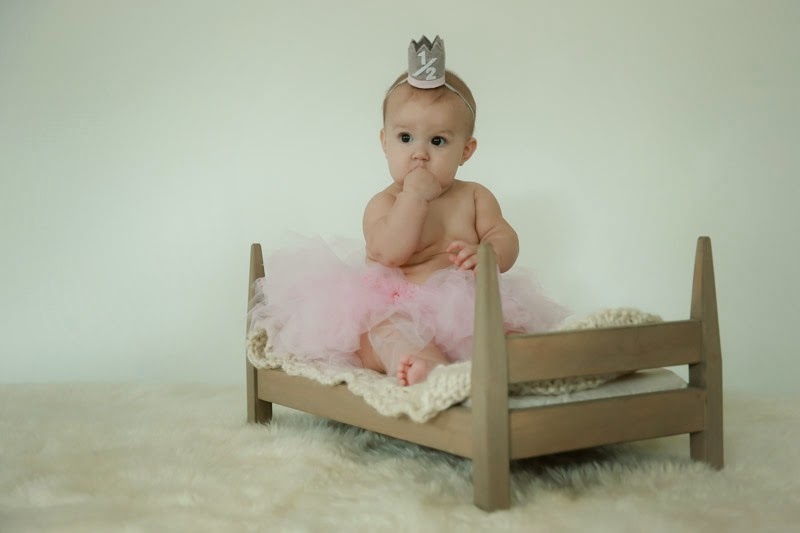 We FINALLY got Amelia's 6 month photos taken this past Saturday! I was hesitant to commit to a 9:30am slot as we would be cutting in to Amelia's regular nap time. We usually have a pretty large window to work with; unfortunately, our photographer was booked solid with senior shoots Saturday and Sunday and left for the East coast on Monday. Alas, 9:30am it was. As I suspected, Amelia was a cranky, fussy, typical diva! She spent most of the time crying and clinging to me. Fortunately, our photographer's studio is in her walkout basement, so her youngest daughter hung around to entertain Amelia as she tried to get some good shots. From the photos, you would never guess Amelia was crabby! To get this shot, our photographers poor daughter was jumping around making animal sounds and holding a giant teddy bear just to get Amelia to look at the camera! I attempted to keep her attention by feeding her puffs and teasing her with a pacifier. 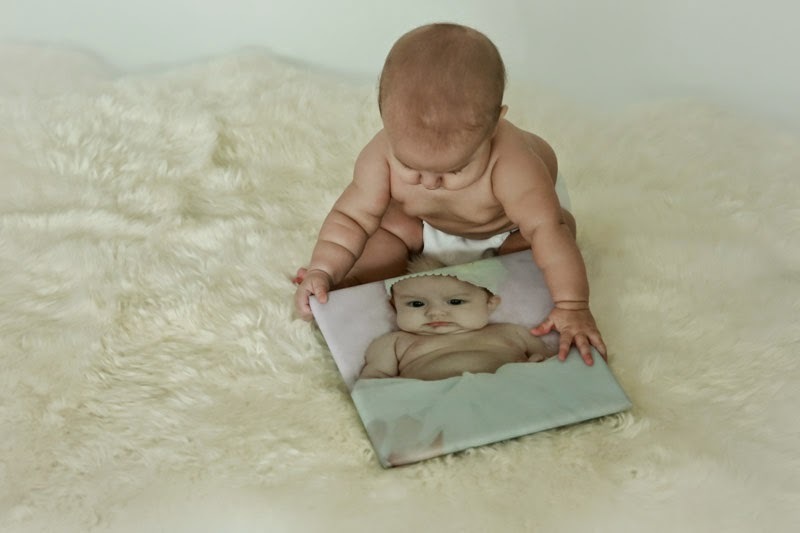 The canvas Amelia is holding is from her 3 month shoot. Our photographer loved this picture so much that she had it made into a canvas to hang in her studio! We plan on using it in future sessions to document just how much this little girl has grown. How much fun is that?! Surprisingly, we had the greatest luck playing peek-a-boo with this blanket! This was one of the last shots we got and turned out the best! Amelia was so happy to be "free" and just do her own thing. We got plenty of Mommy and Me pictures at this shoot (not complaining!)! Amelia was SO clingy at first that she wouldn't let me go and we ended up just going with it. She was really interested in the bed and chewing on the blanket. Good thing everything in the studio is baby friendly. Well... there ya have it! Another photo shoot for the baby book. Have any of you readers had an awful photo shoot experience that turned out alright in the end with the pictures you received? I would love to hear! Just a heads up: Garra and I switched post dates next week; I will be posting on Tuesday and she will take my Friday spot. We leave for our FIRST vacation via plane on Wednesday! I am SOOOOO nervous/scared/excited!!! Wish us luck!